Wedding, Birthday, Christening, First Communion? Glickman's offer a range of favours, a delightful accessory to any wedding, birthday celebration, christening or first holy communion. The almond favours (or bomboniere) contain five sugar almonds, symbolising, health, wealth, happiness, fertility, and long life. This ancient European tradition makes an old company like Glickman's seem young! 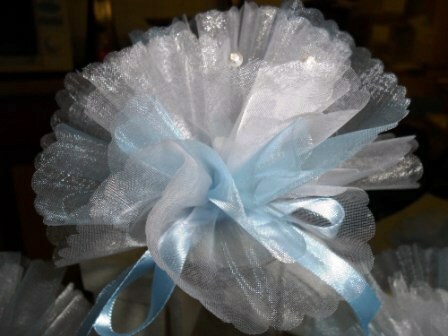 Favours come in various colours of tulle with a wide selection of beads, flowers and ribbons to choose from for trimming. And there is no need to leave anyone out, we also have a selection especially for gentlemen and children. Make it an occasion to remember with our beautiful almond favours. In an assortment of colours and styles to suit the event. Contact us to discuss your requirements or pop into our London Road shop in Glasgow to see our wide range of samples. If you have a particular theme in mind that you don't see displayed then we will be delighted to help! Please call us at the shop regarding all wedding orders before placing an internet order. This box also comes in white and also in silver. We have put a piece of tablet and macaroon into the box. 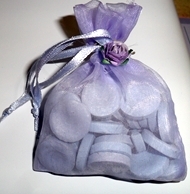 Please call us at the shop before ordering any wedding favour products. 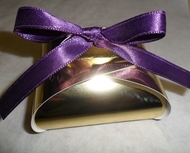 Our wedding favours are made to order. This box can contain two chocolates or other confectionery. If you would like to discuss your individual requirements please contact us at the shop before ordering. This small bag comes in a selection of colours. All the bags can be filled with confectionery of your choice. A flower can be added to the top section as in the picture.Please call us at the shop before ordering online. A selection of favours. We can make up favours to suit your colour scheme. Samples can be made up for viewing. Please ask or email for details.